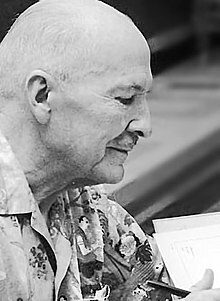 Robert Anson Heinlein (/ˈhaɪnlaɪn/; Julie 7, 1907 – Mey 8, 1988) wis an American science-feection writer. Eften cried the "dean o science feection writers", his controversial warks continue tae hae an influential effect on the genre. ↑ Houdek, D. A. (2003). "FAQ: Frequently Asked Questions about Robert A. Heinlein, the person". The Heinlein Society. Retrieved January 23, 2007. See also the biography at the end of For Us, the Living, 2004 edition, p. 261. This page wis last eeditit on 26 Mairch 2017, at 01:35.